Canada’s federal government is rejecting the Senate’s amendments to the pending marijuana law that industry sources said would make it harder for legal recreational marijuana to overtake the black market. 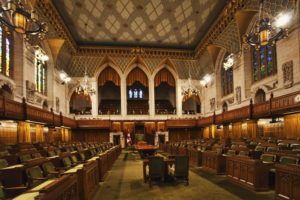 The Senate’s version of the Cannabis Act was approved with almost four dozen amendments. While the ruling Liberal government will accept the bulk of the changes, the most controversial ones are unlikely to make the final bill. Requiring parliamentary approval of new cannabis products (presumably including edibles and infused). Prohibiting “brand stretching” – the use of cannabis brand elements that are not on packaging or accessories. Making public the names of shareholders who hold more than 5% of any class of shares of a cannabis company. Giving regulators the authority to cap THC potency for certain products. Allowing provinces to ban home cultivation. Deepak Anand, vice president of government relations for Toronto-based Cannabis Compliance, said industry welcomes the move. “From a business perspective, it’s great for the industry. Businesses wanted to see pushback on a number of things,” he said, predicting the law will be approved by the end of next week. The House of Commons is expected to vote on the updated measure – with the controversial amendments removed – in the coming days. Then it heads back to the Senate, which will choose between acquiescing to the House’s changes or further debate.